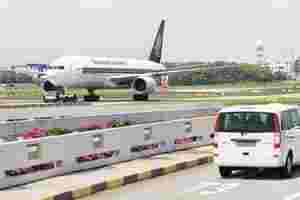 Kuala Lumpur: The year-end festive season usually heralds a busy period for Asia-Pacific airlines. But this year, a global economic slump has choked passenger and cargo traffic—and 2009 looks even gloomier, corporate executives and industry experts say. While the drop in fuel prices has provided some reprieve, air traffic demand has fallen as companies and tourists cut back on travel. The International Air Transport Association (Iata) has warned that the aviation industry faces its worst revenue environment in 50 years. Asia-Pacific carriers, which account for nearly one-third of global passenger traffic and 45% of the global cargo market, will be badly hit with losses to more than double from $500 million (about Rs2,400 crore today) this year to $1.1 billion in 2009, Iata predicts. Aviation experts say regional airlines should be able to weather the downturn better than their US and European peers because they have relatively strong balance sheets and more modern fleets. Also, a number of airlines, including Singapore Airlines, Malaysia Airlines and Chinese carriers, are state-run, meaning they could get government support if needed. Some analysts have said the region has less competition than the US and Europe, where more airlines compete on the same routes. “Asia-Pacific airlines are generally better placed than their counterparts elsewhere amid difficult times but they will still feel the pain," said Nicholas Ionides, regional managing editor of Flight International magazine based in Singapore. While Japanese carriers appear to be having a solid year-end, major carriers Japan Airlines and All Nippon Airways have slashed their revenue forecasts, and the economy there is slowing. Airlines in Australia, China and South Korea are also struggling as their economies slow. India’s carriers, which are grappling with high taxes and insufficient infrastructure, can also expect lower demand following November’s terror attacks in Mumbai. Globally, air traffic will fall 3% next year, Iata predicts—the first drop since 2001, when September 11 terrorist attacks battered the industry. Many airlines have cut capacity and shed jobs to cope with high oil prices earlier this year. In recent weeks, nearly all carriers in the region also slashed fuel surcharges and offered fare deals in response to declining fuel prices, and this could lure more travellers. But signs of trouble are evident even among the region’s top players. Korean Airlines Co., the world’s largest international cargo carrier, posted its fourth straight quarterly loss for the third quarter due to a weak won, which raised the cost of purchasing fuel and servicing foreign debt. Cathay Pacific reported its first half-year loss since 2003 and said its full-year results would be “disappointing" amid weakening revenue and losses from fuel hedging. Cathay has plans to park two freighters, offer unpaid leave to employees and possibly delay construction on a cargo terminal to cut costs. It will also scale back services to North America but add flights to Australia, West Asia and Europe to keep passenger growth flat in 2009, but the airline won’t cut any destinations. Singapore Airlines said its third-quarter profit dipped 36% and warned of “weaknesses" in advance bookings for 2009. Japanese carriers’ business has recovered recently as the yen’s appreciation against the US dollar and other currencies made travelling overseas cheaper for Japanese. Still, All Nippon Airlines has cut its net profit forecast for the full year by a third and deferred plans to order a new jumbo aircraft. Australia’s Qantas Airways has cut 1,500 jobs and plans to reduce capacity to the equivalent of grounding 10 planes. It also trimmed its full-year pretax profit target by one-third. In China, the forecast boom in travel during Beijing’s Olympics year never materialized. The state-run airlines recorded combined losses of 4.2 billion yuan ($613 million) for January-October. Slammed by surging fuel costs earlier in the year, the airlines lost again in fuel hedging after recent drop in prices. “The overall airline sector appears to be in its worst mess ever, and it will be pretty hard to survive," said Song Weiya, a researcher with Great Wall Securities in Shenzhen. Authorities have urged state-run carriers to cancel or delay aircraft deliveries. It’s two biggest airlines—Shanghai-based China Eastern Airlines and China Southern Airlines in Guangzhou—are in the midst of receiving 3 billion yuan ($440 million) capital injection from the government. China Eastern, which earlier failed to sell a stake to international investors, may now merge with rival Shanghai Airlines, an ally of flag carrier Air China. In New Delhi, state-run Air India is eyeing a government bailout to cope with a harsh downturn. Analysts said airlines will gravitate toward mergers and seek government support to fend off the downturn. Consolidation helps airlines by cutting costs as they share resources and feed more passengers through hubs. After merger talks between Qantas and British Airways collapsed recently, some analysts say Qantas may seek a deal now with Asian carriers. Malaysia Airlines has expressed interest, saying recently it was in talks with a number of carriers, including Qantas, on possible partnerships. AirAsia, the region’s biggest budget airline, is taking a contrarian approach by adding flights and expanding amid the slump. Chief executive Tony Fernandes believes AirAsia will benefit as travellers downgrade to budget carriers. It became the first airline in the world to remove fuel surcharges on all its flights last month. AirAsia expects to fly 19 million passengers this year and 24 million in 2009, he said—up from 15 million last year. The carrier plunged into the red for the first time in the third quarter, largely due to foreign exchange losses and unwinding of fuel hedging contracts. But Fernandes said AirAsia has no plans to cancel or defer its order for 175 Airbus aircraft, of which 55 have been delivered with nine more targeted for 2009. “We are confident," he said. “We are a beneficiary of the economic slump just like McDonald’s and Wal-Mart as people are looking for more value."